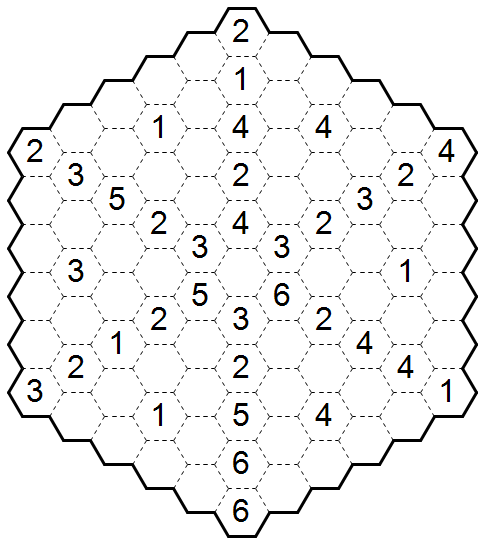 This is a Fillomino puzzle on a hexagonal grid. All the usual rules apply. Like Skyscrapers, Hexagonal was another variation that never really got off the ground. This is an Akari puzzle on a hexagonal grid. All usual rules apply. 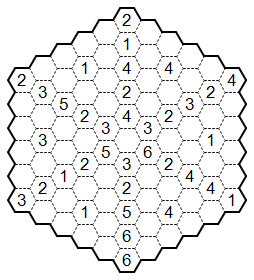 This is a Castle Wall puzzle on a hexagonal grid. In addition to the usual rules, the loop may not make any sharp turns that form 60 degree angles.